Overall body dimensions: 3.0 x 3.0 x 0.85" (L x W x H). Usable area of 65.0 x 65.0mm (2.56x 2.56 inches). Includes 2 pieces of brass barbed fittings for 1/2" ID tubing. Measures: 3.0 x 3.0 x 0.85 inches. Usable flat area of 2.56 x 2.56 inches (65.0 x 65.0 mm). Inlet and Outlet on the same side. 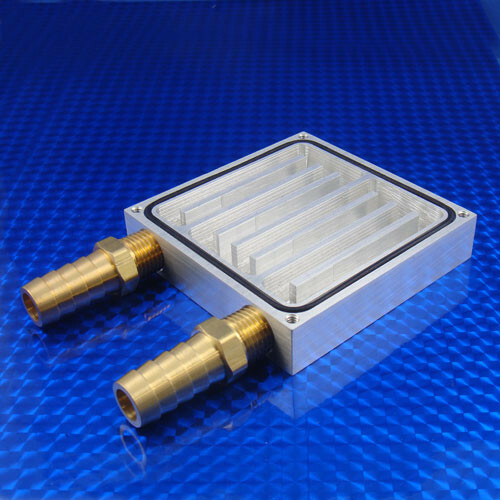 Maximum service temperature is 125 C.
Any object to be cooled up to 65 x 65mm. 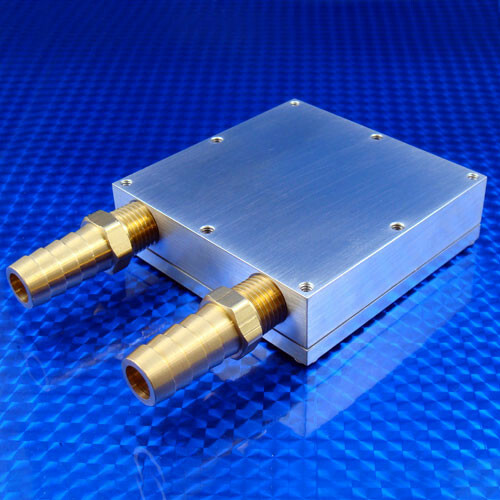 2, 3, or 4 TECs or TEGs up to 30 x 30mm.